The robotics and automation industry has always held a fascination for many people – for seasoned professionals and even passing observers alike. And it’s been particularly interesting in the past couple of years, for several reasons. One reason is the advancements in computing – both hardware and software, perhaps most importantly in networking. But, arguably, the fastest-growing market in the next few years is going to be the category of logistics automation. It’s a broad area, but one segment stands out. Ever since Amazon bought Kiva Systems and took the company’s mobile warehouse robotic platform off the market, there has been a huge, gaping hole in this product category – and a big market opportunity. Moreover, Amazon has shown the value of logistics robots. It’s probably the critical technology which enables the online retail giant to offer next-day deliveries across the expanse of the US and much of the world. In some places it even offers same-day delivery. With online shopping, and e-commerce in general, growing at an exponential rate, and logistics companies looking to increase productivity and efficiencies, it seems automating warehouses in every way possible is a pressing concern for many would-be competitors of Amazon. 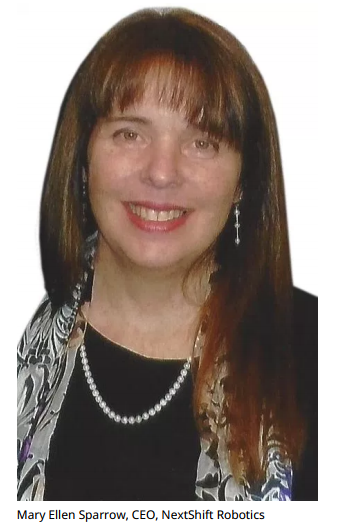 In this exclusive interview, Robotics and Automation News speaks to Mary Ellen Sparrow, CEO NextShift Robotics, which produces a logistics robot it calls TM-100 as part of a broader material handling solution. Sparrow’s background in robotics is as good as anyone’s in the industry, both in terms of education and experience. The computer science degree, combined with more than a decade of experience at companies such as Brooks Automation and Harvest Automation, led Sparrow to the point where she and her partner co-founded NextShift last year. Sparrow tells her story. “I have a long history in robotics and material handling systems, starting back in the ’90s, with PRI Automation. We created material handling systems, such as monorail systems for the semiconductor industry, and I did that for eight years, and then it got bought by Brooks Automation. “Then I switched over into Symbotic, where we did warehouse material handling systems for the food and grocery industry, doing case pallets using very large ASRS systems [automated storage and retrieval systems]. “Then I switched over to Harvest Automation, where we created a mobile robot collaborative system for collaborative e-commerce and cellular manufacturing. Just as the so-called “last mile” is the most complex part of an online shopping order to a customer, the final composition of an order inside a warehouse can also be the most convoluted. Say, for example, you place an order for a dozen items, each of which is different – one might be a metal object, another one a plastic one, yet another made of glass, and so on… and that’s even before we consider the packaging. Differentiating between these products is too difficult for most robotic systems of today, which is why humans do the “picking”, as it’s called. And, of course, a typical warehouse can contain hundreds if not tens of thousands of different products. Most robotic and automation systems in warehouses concentrate on moving batches of goods around, on pallets and in boxes, or totes. But Sparrow says that NextShift has been able to innovate within these limitations. Moreover, NextShift’s automation system does not require any restructuring of the warehouse. Sparrow explains. “Basically, what we do is split-case picking, which means that you open the case up and you’re picking one or two items to either ship to a store or ship to a consumer, which is different to case-picking and pallet-picking and all those types of systems. more items from that shelf and then move the shelf back. Then another robot would move the next shelf in for the picker to pick from. And so on. “What we wanted to do was to take a different approach from the Kiva system. “So, regardless whether Kiva had been bought by Amazon or how the market has played out, our system is another step in the evolution of split-case picking. “And in doing that, we didn’t want to clear-cut the warehouse shelving. We wanted to leave the shelving as is, so that the warehouse could keep their existing infrastructure. “We also wanted to be able to get at the inventory at any time. “Right now, with large ASRS systems, if the inventory is in some area where someone has to get there, they might have to take the system down and to actually walk in and get that. “Also, with big, large ASRS systems, you have to keep at least 15 per cent more of the inventory to deal with redundancy issues so that you can always get at your inventory at any time. “So we wanted to create something much simpler, and something that went into the warehouse in a very short time. So we actually integrate into the system in a matter of weeks – not months or, sometimes, even years. “What we wanted to do was something simple and efficient and cheap for the new millennium, for the new market space. “And that’s why we created NextShift. “It’s a collaborative system, with mobile autonomous robots that move the totes [open-top plastic boxes] from location to location. It offloads the picker from having to lift a 40-pound tote. It offloads the picker from having to walk miles and miles in order to complete the orders. The most important component in NextShift’s solution is probably its software, which manages a process that the company has patented. This patented “workflow” basically organizes the movement and picking and placing of items across the whole operation, and makes everything more efficient and more productive. Sparrow explains. “What happens is that, basically, the software tells the robots where to place the totes throughout the product aisle. “And then the software tells the workers how to place items within those totes, so that they stay within a small area and they’re not walking around the whole facility, and they are walking independent of the robots’ work. “Then the software tells the robots that the item has been placed in the tote, and they can now move the tote to either shipping or to another product area, to have more items put in for that particular order. “So what happens is that, unlike a lot of our competition, we’re not tying the robot and the worker and the order all together. “In some systems, the worker will lead the robot and the order around the whole facility, or the worker will follow the robot around the whole facility. We don’t do that – we wanted to separate those. “And in other systems, the robot and the order, once the tote is placed on the order, the robot has to traverse the whole facility to complete that order. We didn’t want to do that at all. “So what we did was separate all three, so we’re more efficient. 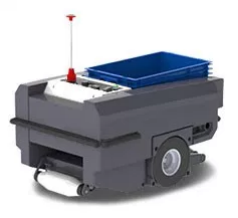 The ability to put that tote down automatically means different robots can move an order tote around the facility. “A lot of companies have been creating a cart that’s automated, and then the worker and the order and the cart are all together. A lot of warehouses have conveyors which carry the goods around the entire facility, and human pickers are located in specific areas where they can take an item off the conveyor and place it in a tote ready for shipping. NextShift’s solution does not require a conveyor, however, and anyway they have their drawbacks, says Sparrow. Anyway, NextShift’s system sounds more like a scenario where you can imagine a warehouse aisle being like a shop, and the human “shopkeeper” has TM-100s as customers. They visit, ask for something, then they’re merrily on their way again. Or you could think of the system as a conveyor which has been separated into small pieces, and each piece is carried on a TM-100, which goes to the worker who has the product required for the order. “Once you put a conveyor system, you’re starting to build your whole process around that conveyor, because that is fixed to the floor, and it’s difficult to move the conveyor once you put it in. with how they’re doing their automation. “You can kind of think of it like a phone. A long time ago, phones used to be tethered to the wall in your home. “And then all of a sudden we started to get cellphones and we started to be able to walk wherever we wanted and talk on the phone. “And in doing that you freed up a lot of your processes, and a lot of the ways you did things. “And it really revolutionised how you look at making telephone calls in your home or outside or wherever. 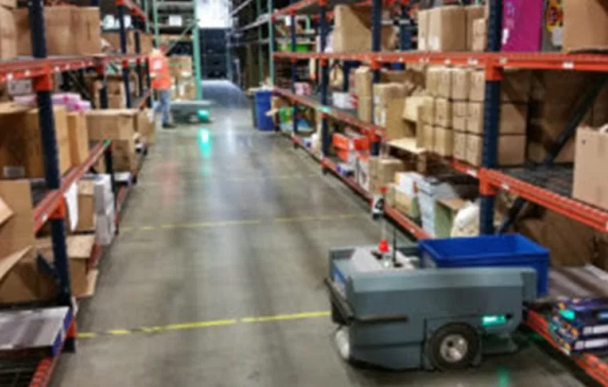 And although NextShift does offer a mobile robot, the TM-100, Sparrow says it’s just one part of a complete solution, which also includes a smartphone app. 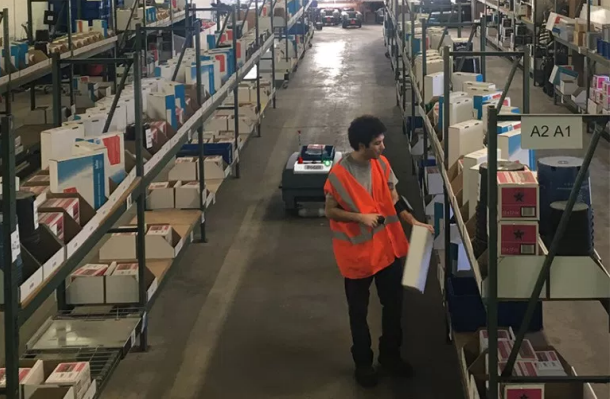 “We connect all the way up from the warehouse management system, through a fleet control system, through to our robot,” she says. “And we also connect to a web app for our picker. “So it’s a material handling system that uses collaborative robots, as opposed to simply being a robotic extension. “So we are a material handling system and we have a lot of software that supports the whole, entire system that actually allows us to get the gains and efficiencies that we’d like to see. Sparrow says NextShift has a lot of plans for new technologies it wants to patent, although wouldn’t reveal what the company is working on right now. “We have other patents that are pending that we can’t really discuss yet – they will come out later,” she says. Some people say that the software used in the robotics and automation sector will probably see more innovation than the hardware since the hardware is probably as good as it can get. After all, what else does a logistics robot need apart from wheels to move around on? “I do disagree with that because by marrying the mechanical design with the workflow is how you get something unique and get something to work in a way that’s innovative. maintenance, the software is going to alert folks when parts need to be changed on your robot, the software is going to tell your people how they’re doing in moving material around from one area to another. “There’s a lot of learning that goes on to make the hardware better by using the software, so the software is constantly being enhanced. “As far as patents go, we usually do our software more as a trade secret than as a patent. And we usually do more of our mechanical design with our workflow as a patent. “And that’s kind of how we break it up. “A lot of times, what you’re looking for is, as software advances and is able to be more effective, you’re starting to see a lot of that software get pushed down to the hardware. “Think of a calculator when you first had it. A long time ago, a calculator was large and very expensive. Now you can get a calculator free on the web and it has all the bells and whistles that the calculator from long ago had. NextShift develops the software and hardware in-house, and Sparrow says the company is learning a lot through the partnerships it is building with customers. Although she wouldn’t say who the customers are specifically, Sparrow said they were from a variety of sectors, including e-commerce, manufacturing, and logistics. 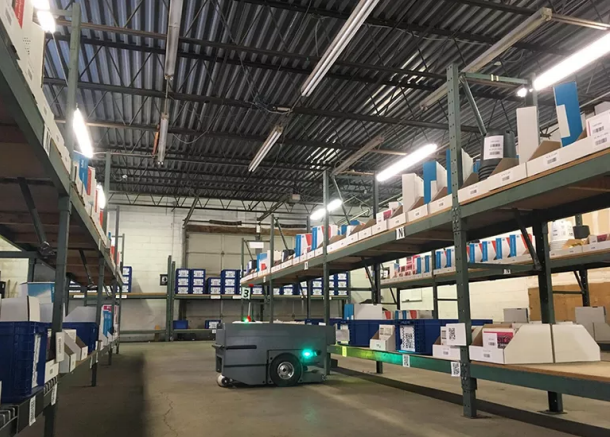 Warehouse robots are still a relatively new product category, and yet the competition in the market is intensifying, with a number of different companies offering a variety of distinct solutions. Some industry experts say it’s often a good thing when that happens because potential customers are likely to be more aware of the technology and what it can do for them. This is obviously a crucial factor for companies which develop entirely new technologies. Even if your product is amazing and can save buyers a lot of money and make them more productive, if they don’t know what it is and how to use it, they simply won’t buy it. competitors because of our patented workflow, and how we differentiate and separate the robot from the worker, from the order, and doing that gives us much more throughput and efficiency. “But we are seeing more systems with collaborative robots out there, and more systems like ours that are going in quicker and cheaper and more efficiently for the customer, to meet the customers’ demands. “And we are educating the customers. Some customers are savvy and kind of understand the technology. Other customers have been doing manual methods, and this is kind of a new jump for them. So we are seeing both types of customers. Sparrow reiterates what she sees as an important factor in NextShift’s favour. “What you’re also seeing is that people don’t want to have to clear-cut their whole facility to put in automation. They’re trying to put in automation as they currently have it, so it’s cheaper and faster and quicker. “And also, let’s face it, Amazon is driving the market, and it is making us all want to go faster, and we’re seeing challenges from the competitors of Amazon who believe they can get the next-day delivery as well. There’s always talk about how robots are going to take everyone’s jobs and then cart us all off into the wilderness to fend for ourselves. While a real-life I’m a Human… Get Me Out of Here! scenario may yet turn out to be our collective future, the history of robotics and automation does not suggest that this is inevitable, argues Sparrow. “I think we’re trying to make the human aspect of jobs more palatable, and better,” says Sparrow. “In doing that, what robots do, and what they’ve done historically, in the car industry and in manufacturing, and any other job, is that they try to offload the unpleasant parts of the human worker’s job, and make their jobs easier. “And that’s exactly where robots have been fitting in throughout history – they’re trying to do the jobs that humans are not meant to do, or are tiresome for humans to do. Sparrow suggests these are some of the ideas behind NextShift’s products and solutions. “I think the real thing is how the worker enjoys the system, because now what we’re doing is helping the worker. “In order to get these orders done, the worker is not under so much pressure, because the robot is doing work for the worker. “So the worker doesn’t have to lift a 40-pound tote, the worker doesn’t have to walk all across the cement floor for miles and miles on end, and the worker can basically not have to push a heavy cart, which is getting heavier with each added item. “So we really help the worker. And the worker can take a break. “I mean if you look at some of these systems where the cart is tied to the robot and tied to order, at least our worker can take a break and then come back in. arm on it, you might assume that it should be able to wander around a warehouse and pick out all the items it needs to fulfill an order. our mobile autonomous robot – they’re going to be using sensor fusion to be able to do that. “I don’t think it’s just one particular way of doing it. “I think with bin-picking, you have to be able to go into a bin, and then identify a transparent object, a semi-transparent object, a soft object, a cloth object – there are so many different types of materials that are in a bin. “I have every faith that people will accomplish this task, but I think the task is going to involve things like analytics – historical picking data – I think it’s going to involve vision, I think it’s going to involve tactile as well. “So I think there’s quite a few pieces in solving that type of a challenging problem.” But she adds that NextShift would definitely be interested in such developments. “I think when the technology is ready to be able to do bin-picking, when it’s fully complete. “I think right now, bin-picking is still an exciting problem, and people are still facing challenges in solving it. There are other technologies, such as augmented reality glasses and devices, which NextShift may look into, for picking. 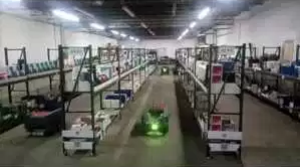 It already has algorithms which can help pickers reduce the time they spend navigating the warehouse searching for things, as well as methods for the robots to avoid collisions with human co-workers. “There’s been a lot of work and advances in trying to move the picking process forward, and there are different ways of doing it,” says Sparrow. She adds: “There’s a few other areas we could look into going forward. This is our first machine, and we will have others, and we will have enhancements to this machine going forward as well.